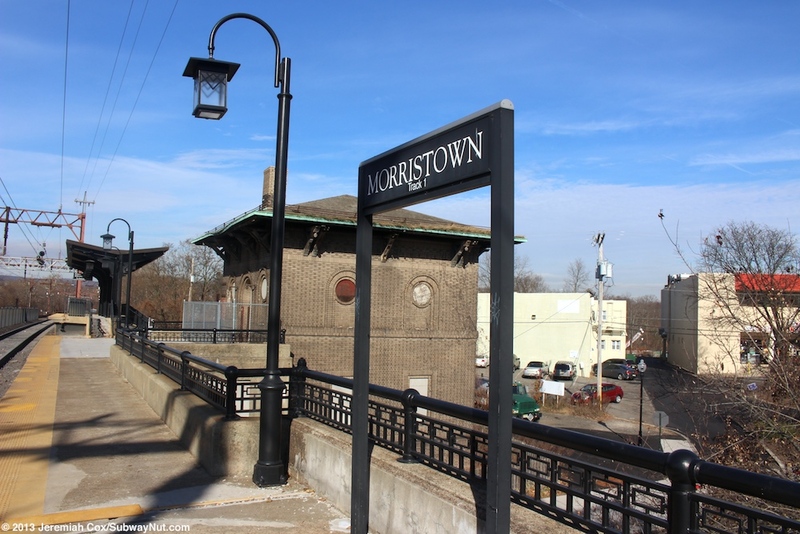 Morristown is the namesake station of the Morristown Line. 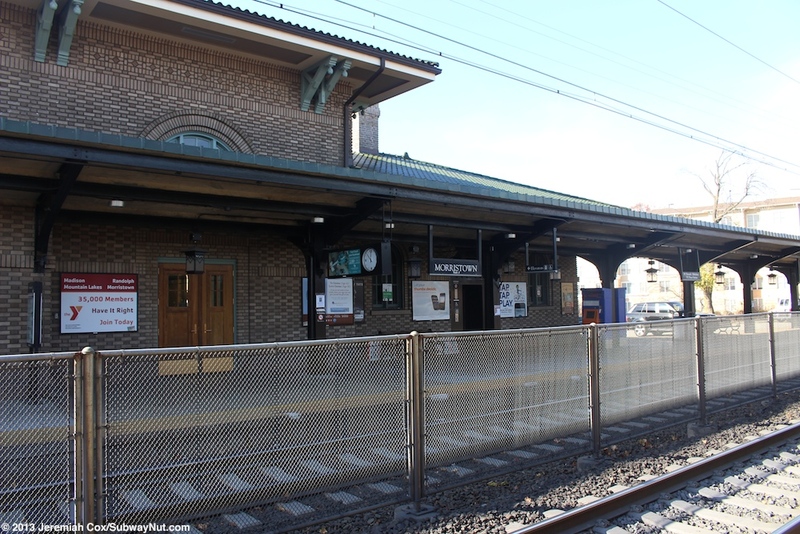 The current station was built in 1914 when the line was grade-separated (there is just one grade-crossing between Morristown and Hoboken at the Convent Station is a private crossing to reach the main gate of the College of Saint Elizabeth) and was designed by Frank J. Niles the chief architect for the Lackawanna Railroad. 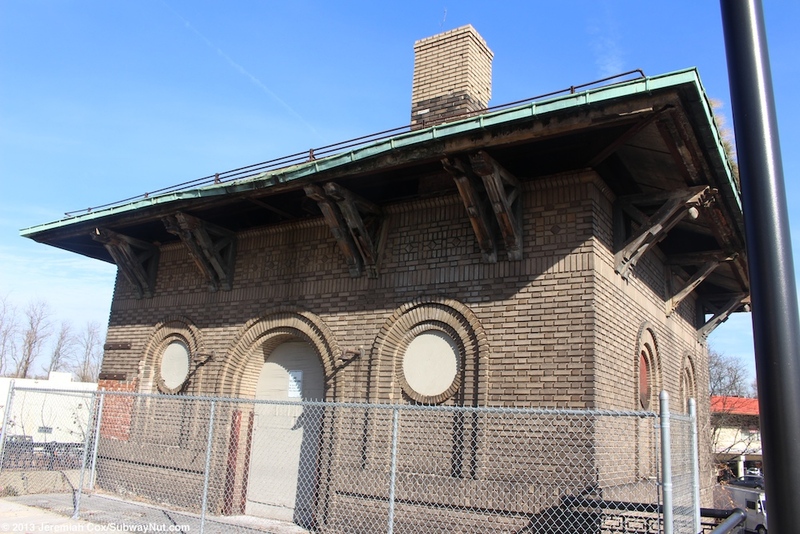 The station's 3 buildings are all made of terra-brick in an 'Italian' Renaissance Revival style. The station has two low-level side platforms for the two track line. The stop (along with Madison) received mini-high platforms at the front of each platform (at opposite ends) and elevators for ADA access up to each platform in about 2002. 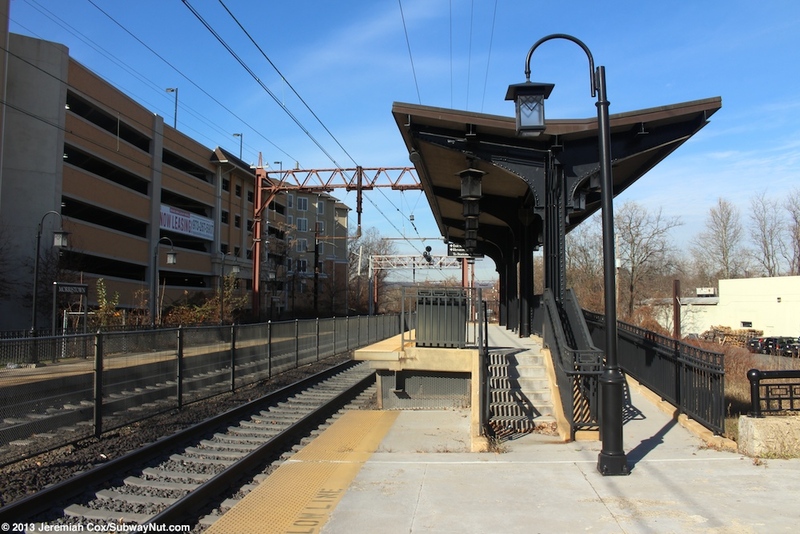 The platforms are each canopied in their midsections for a decent with a historic and original black structure holding up a concrete roof on a black steel framework, on the Hoboken-bound platform the framework was extended to provide covering to the mini-high platform at the southern end, while the mini-high platform on the Dover-bound platform has its own section of canopy. The station's two platforms begin with the overpass bridge of Morris Street at the southern ends of the platforms (with a staircase up to each platform). 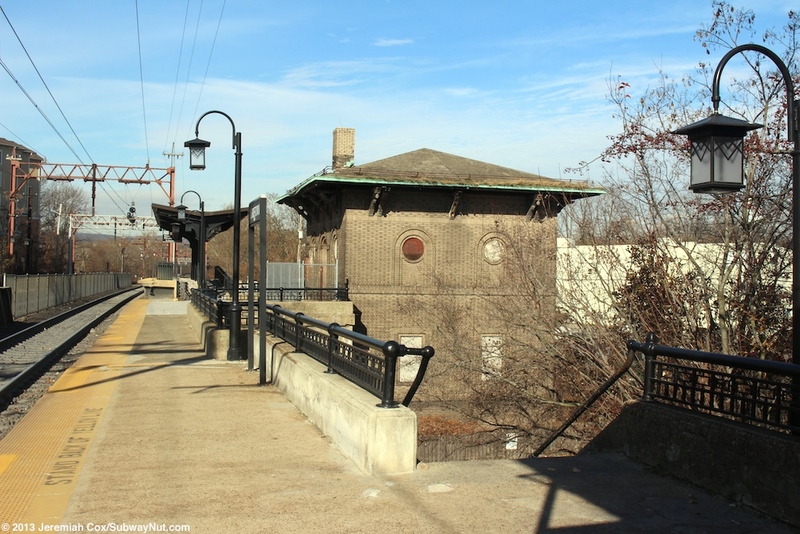 Next are the station's historic station houses along both platforms across from each other. They are in the area where the platforms have a canopy. These are both in the same historic style. The smaller one on the Dover-bound platform is closed and boarded up. 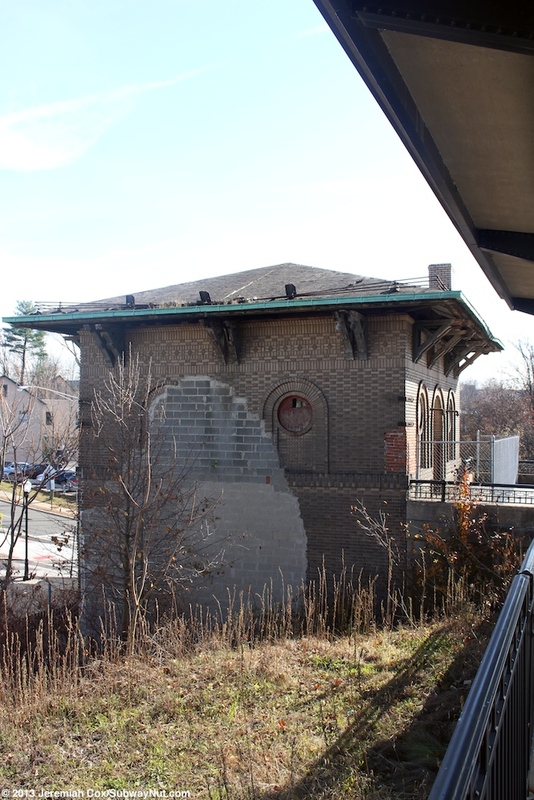 This platform is also high above parallel Lackawanna Place. 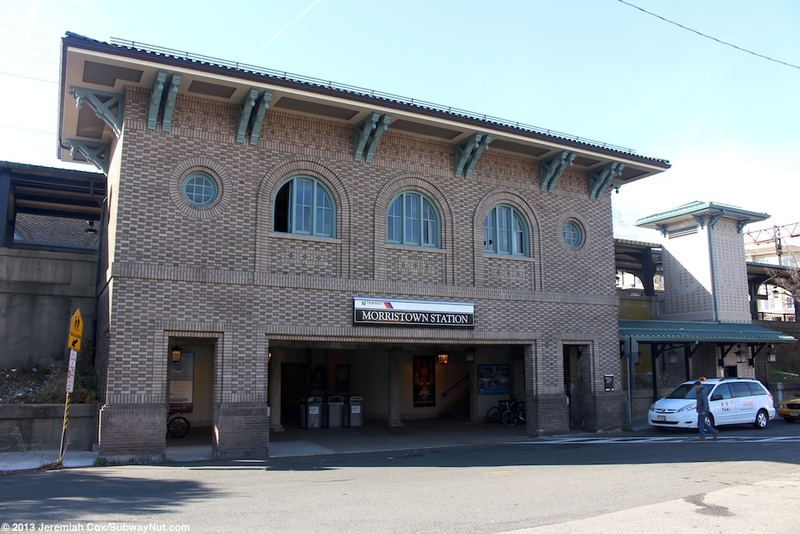 The station house is built with an open area at street level (directly over the sidewalk) and a drop off area is beneath. 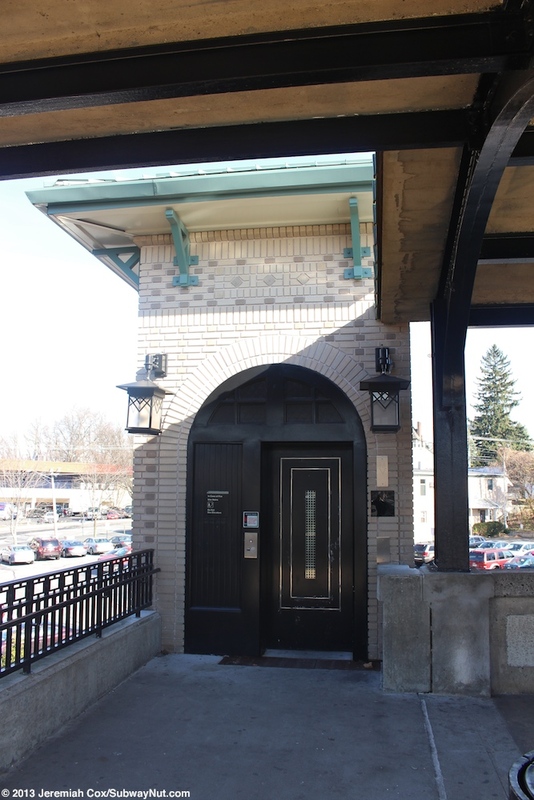 The modern elevator down from this platform is just north of the station house with an attempting to be historical brick enclosed elevator shaft. 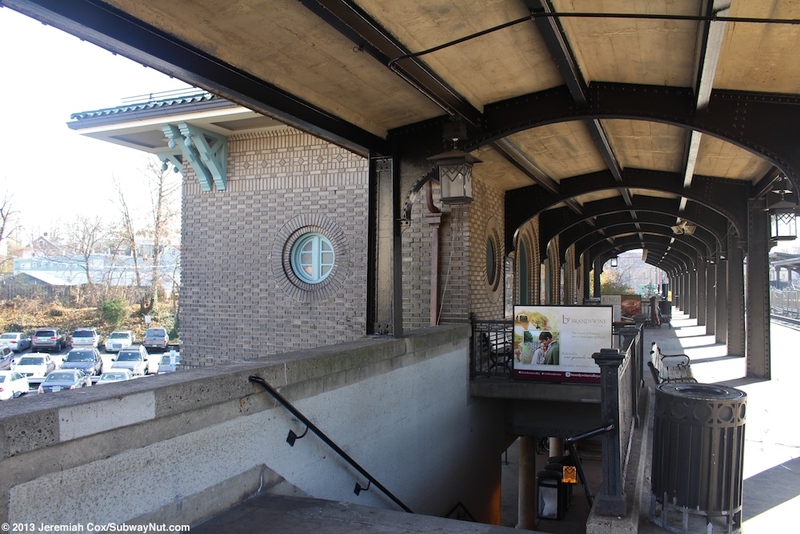 From street level the main pedestrian tunnel begins at two staircases up to the Dover-bound platform before continuing through to an elevator up to the Hoboken-bound platform directly inside its larger historic station house (inside the smaller former freight area in particular) and staircase up to the bus and drop-off loop and landscaped plaza at the same level as the Hoboken-bound platform opposite the actual platform. This large plaza takes the form of an ornamental garden with tons of grass in trees along the roadway (with 60 permit parking spaces) and is designed with the pedestrian in mind (there is a grand pedestrian staircase) directly up to the main station house from Morris Street. 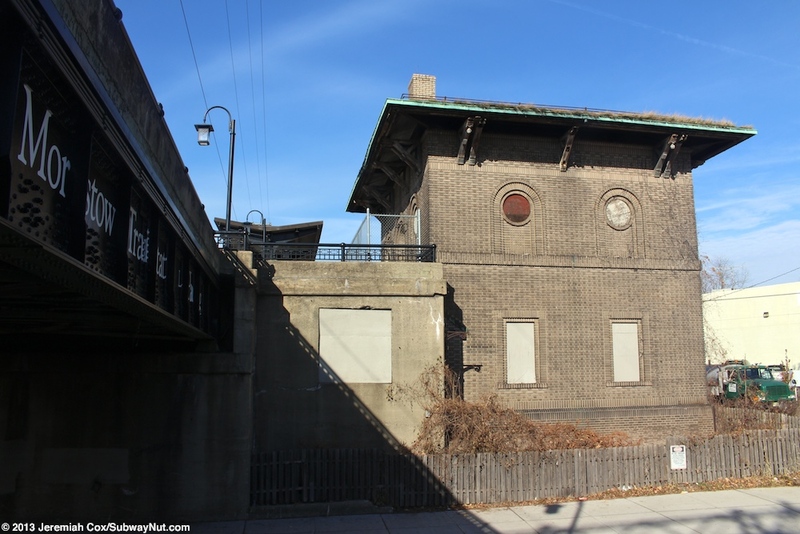 This large building sits at the top of the hill on the street outside of it is a bus stop and terminus of 6 New Jersey Transit bus routes that were formerly operated by NJ Morris Inc and subsidized by the county (not the state). These were originally named MCM1, 2, ect. Although restructuring has occurred. Inside the open part of the station building is a waiting room and ticket office only open when the ticket agent is on duty from 6:30am to 1:30pm weekdays. The waiting room is a gem and recently restored in 2012. There are large cream colored walls with brown trim. The ticket office is an ornate wooden booth on the track side with a clock above the one window. There are two large wooden benches in the middle of the room with ornate glass light fixtures on top of the middle of the benches. Additional benches line other walls. There are restrooms and between them an ornate (but no longer functional) water fountain. 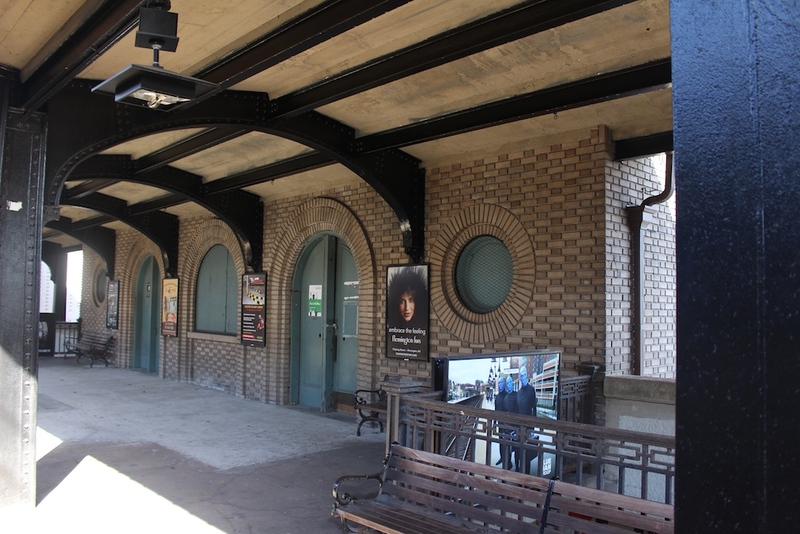 Tastefully painted on each end of the station that compliment and don't dominate the historical architecture are modern murals by Tim Gaydos painted in 2012. These murals are called Eastbound and Westbound. 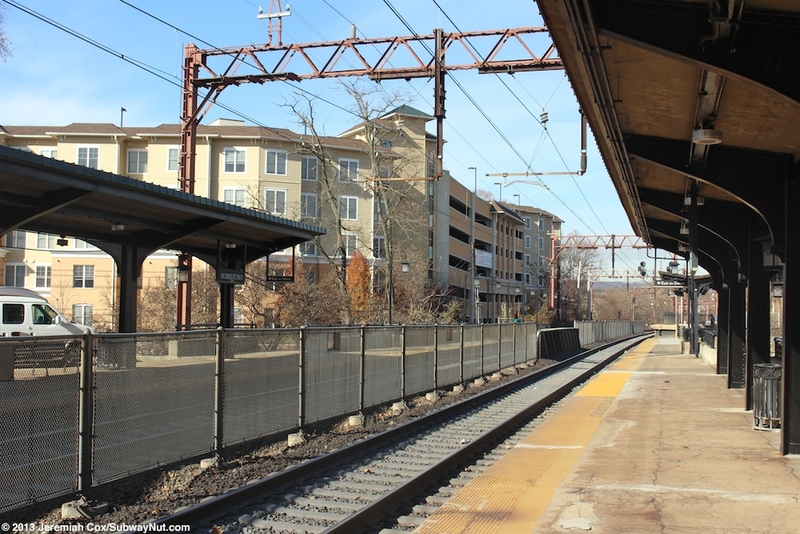 Eastbound shows what is clearly Secaucus Junction (from the platform and lampposts in the image) with an abstract colored skyline of Manhattan in the background. 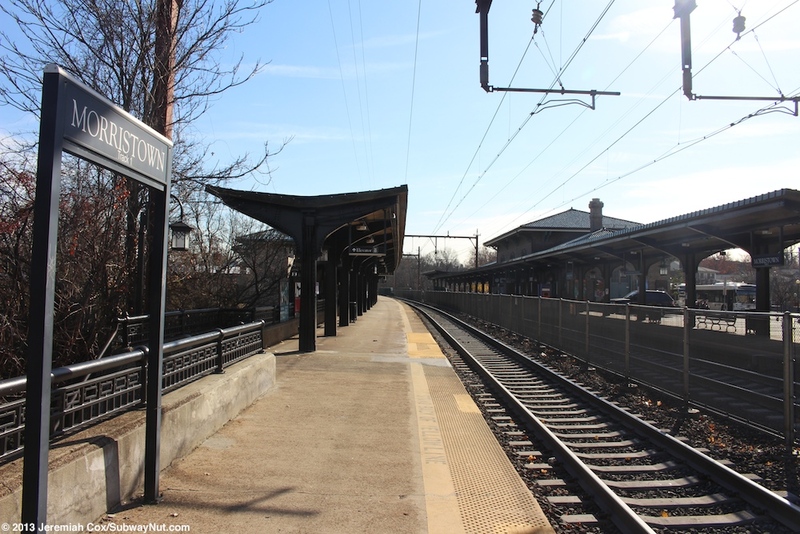 The Westbound is of Morristown with the fewer tracks and simpler platform layout of the train station and its historic steeples and buildings. Towards the northern end of the platforms the tracks and platforms cross above Lafayette Avenue. 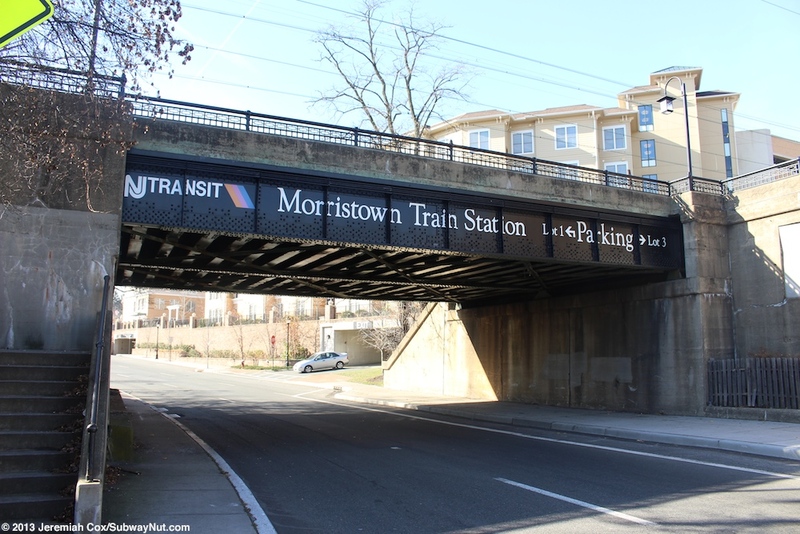 The sides of this overpass bridge have Morristown Station painted on it. A staircase leads off each platform to the southern side of the street. 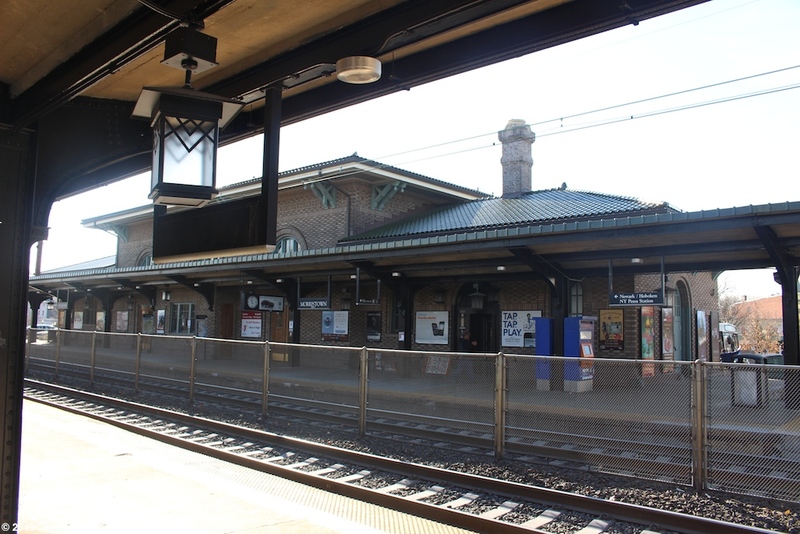 Along the northern side of the westbound platform is a two story brick building in the same style as the historic stations that extends from the platform down to the street. This building's facade along the platform is fenced off and the mini-high platform is just beyond it. 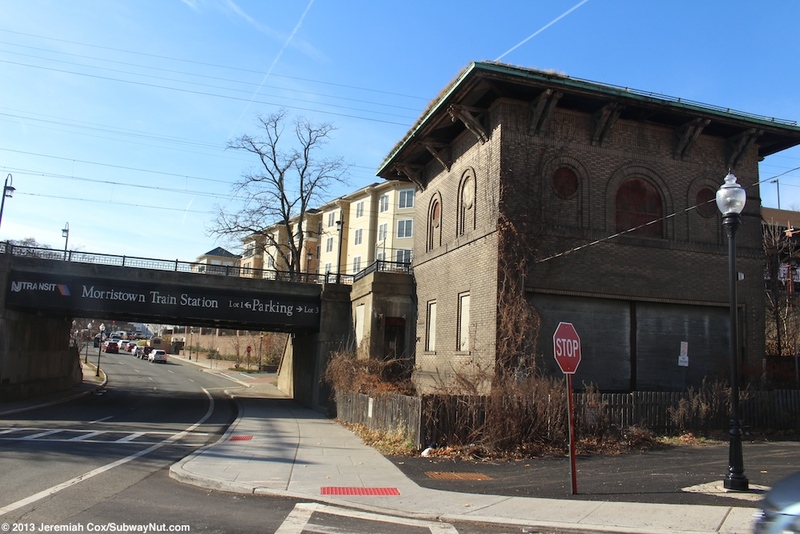 This boarded up building is a historic control tower just before the junction with the main line of Morristown & Erie Railway. 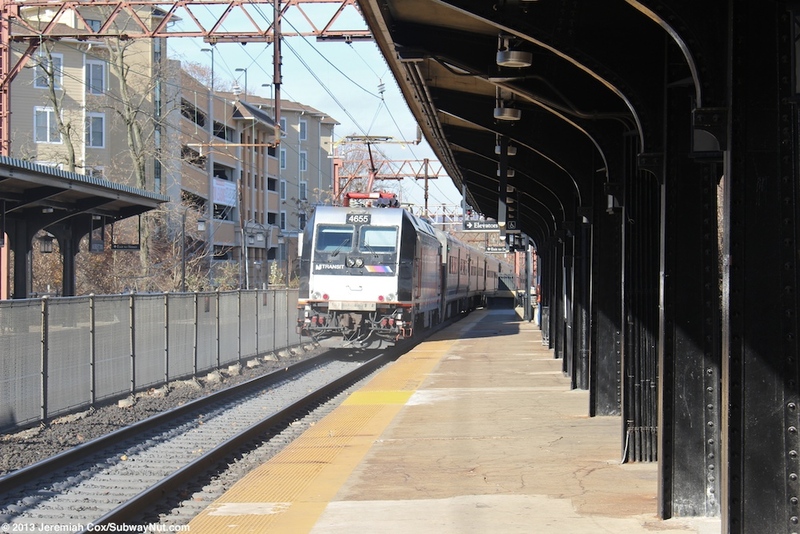 This short-line railway also provides local freight service along NJT trackage along the Morris & Essex Lines. 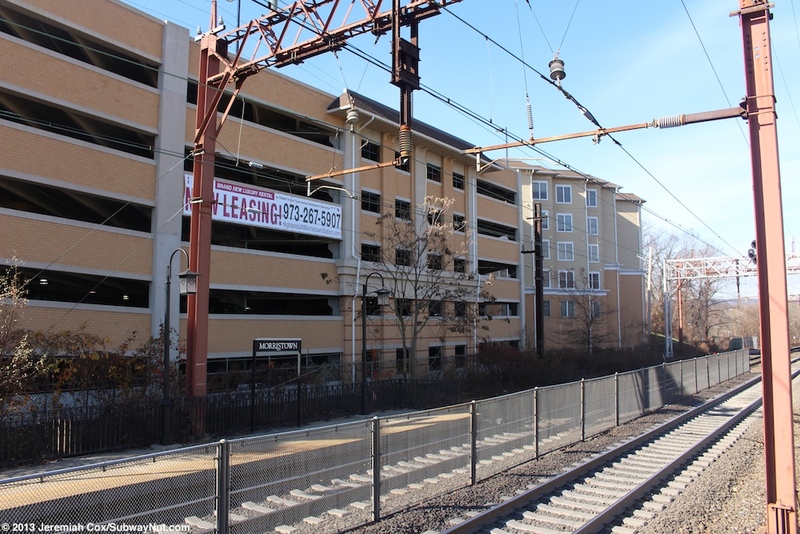 Opposite this, along the Manhattan-bound platform, is a development of town houses, some shops and plenty of parking in garages (406 spaces for railroad commuters). 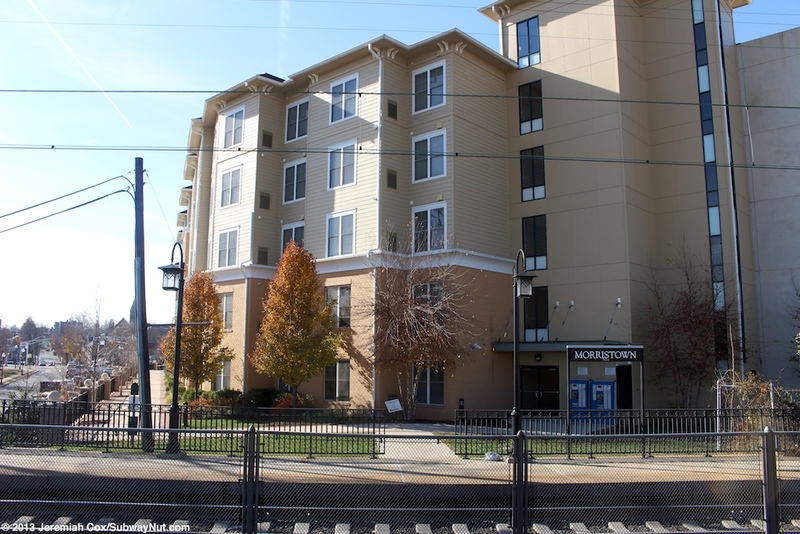 This development is called Highlands at Morris Station and Bills Itself (on the banner facing the platform) as NJ Transit's First Transit Oriented Development in New Jersey containing what else but brand new luxury rental apartments. It is quite well integrated with acress directly from the end of the Newark-bound platform (the fence becomes notably more modern by it) leading to an elevator tower into the parking garage and a public landscaped walkway above the streets below above Lafayette Avenue before leading to the main sidewalk.